Clayton Kendall provides franchise communities nationwide with compre-hensive branded merchandise programs, leading to greater brand exposure, cost-savings, streamlined operations and brand compliance. 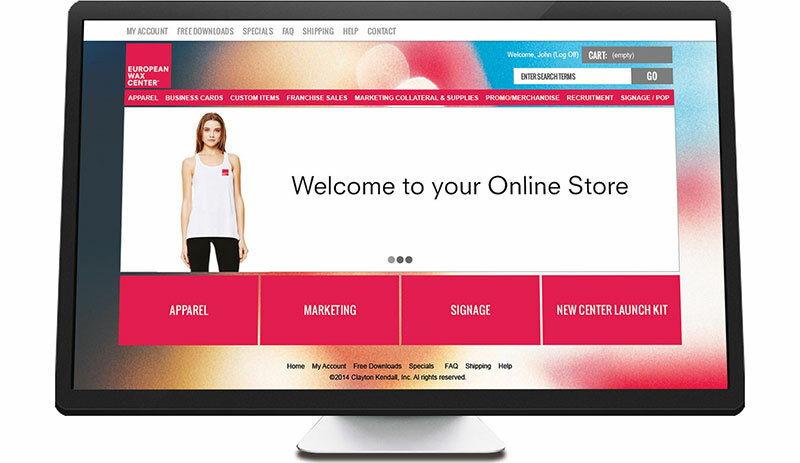 Our customized online stores give franchisees access to advertising and marketing collateral in one easy-to-use program. Our proprietary technology is designed to meet the unique needs of your user community. We help you find the best assortment of marketing tools and display the offerings in a user-friendly, organized fashion The technology platform unifies all aspects of the program and provides management with control of the brand as well as spend. Reports can be customized to monitor inventory, purchasing patterns, store profiles, participation and compliance. Our technology-based programs are scalable and can grow with you as the community expands. You control the offering of different materials, marketing collateral and price points to specific regions. Also, we can assign varying levels of access to your users, including franchisees, regional managers or corporate. Spend can be tracked by items, user, region or any measurable data. Inventory can be tracked real-time. We monitor purchasing patterns to help you manage your spend, validate brand strategy and monitor compliance. We offer drag-and-drop technology that allows you to easily select the specific data that you want to review. Customizable reports are available as well as dashboards. Our software assists you in setting budgets and controlling spend by individuals or user groups. For example, you can limit a specific dollar spend per person, product, department or location.